Elizabeth Ann Rexer Leonard (a.k.a EARL) grew up in Huntington, Long Island. She spent her high school years working on her brother’s organic vegetable and poultry farm. Later when she went to college in Rhode Island, she found herself once again yearning to get her hands dirty. She began working for Greenview Farm in Wakefield, RI. Over EARL’s four year stay at Greenview, she gained integral knowledge in the practice of organic growing methods. Returning to Long Island, Elizabeth decided to further the good food movement in her community. EARL’s Kitchen Gardens now services over four dozen residences, three schools, as well as a summer camp for at-risk girls. Being with Dad who shared his love of nature. Youngest of 8 kids and home with dad a lot. Working in harmony with nature, encouraging biodiversity, following the rhythm of the seasons, working with the land not against it, these things are all so important if we are going to have a healthy ecosystem and something we are going leave behind for future generations. By learning about practicing what she learned on farm, although gardening is a bit different then farming. Heirloom tomatoes – 6 different kinds. The Queen of Tomatoes – Cherokee Purple, Black Prince, Straight German, Moskvich. Personally more shelling beans, and water barrels to help heat hoop house. Fruit trees, figs and herbs and perennial plantings for clients. Cold frames to extend seasons. One of the biggest challenges is empty spaces that creates a lot of hand weeding. Cucumbers – prolific. Swiss chard. Lettuce. Start with just 3-4 things you want to grow and then add something a year later. People who have never grown food before want to grow Avacado trees. Italian zucchini – A cucuzza, or gagootz. A zuccini that grows on 50 foot vine! Fruits/zukes are like 3-5 feet. Tomatoes. Make a priority to prune and inspect and overly nurture tomatoes plants. Last year grew lots of hot peppers – jalapeños, habaneros, ghost peppers … and eggplants. Eggplant tip – start inside as early as possible and then put out as early as possible for long growing season… pull of leaves, prune to get more flowers, fish emulsion and chicken manure produce a lot of leaf and not a lot of fruit. Trace minerals are important – oyster shells and crush them to boost calcium. Need to watch NPK. At GreenView Garden boss was a sous chef and grew for restaurants. Would pick baby squash. He would say “Soft hands.” Work with nature don’t work against it. Shutting it down. Would love to have all gardens growing 4 seasons. Looking at it at the end of the day and thinking about what to do different in the following year. My shovel because it is everything … it can scrape boots, cut strings, etc. If it smells good to you it smells good to them. Encourage people to take things a little pre-maturely, because tomatoes start to smell really good when they become ripe, as soon as shoulders start to turn color and the animals can smell them too, so you don’t get a pest problem. Big freezer…cut up butternut squash, roast, then blend and throw in bags in the freezer. Wilted greens with olive oil and salt. Moosewood cookbook. Jackie added the Broccoli Forest Cookbook from the Moosewood Kitchen for her pie crust recipe. Cold tomato/cucumber/dill salad with feta cheese. Sometimes apple cider vinegar with salt. Maybe some mint and watermelon. 4 Season Harvest by Elliot Coleman forefront of organic movement and moving things forward. Started Kitchen Garden Businesses because it’s so expensive to live on LI, lots of red tape. Wanted to teach people how to be vested in food that they consume and how to grow it themselves. Use clients backyards, install raised beds, help with irrigation and maintenance, one-on-one instruction to empower them to do it themselves, care for them, without their participation it wouldn’t work. 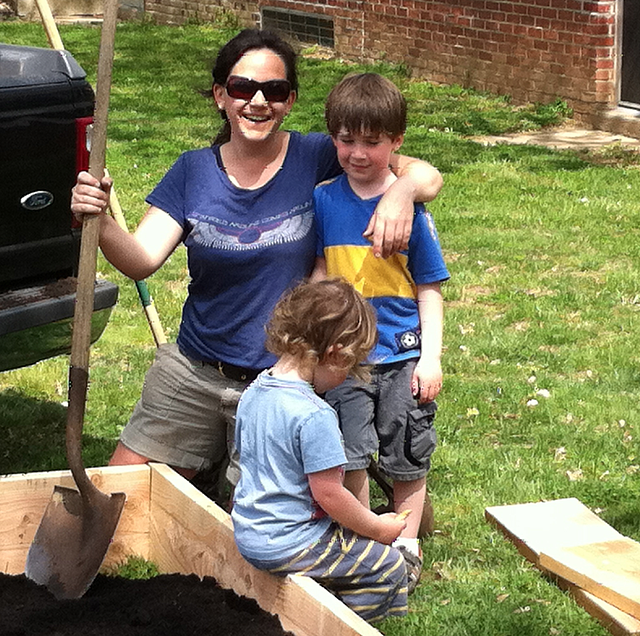 Have 3 schools – one Montessori school – children do everything including building box beds and growing plants in the classroom- so hands on it’s awesome. Get to learn about plant genetics K-6 grade. Best part is kids get to eat it – harvest, wash and serve food. Little more red tape at other schools so kids can only do taste testing in garden but can’t bring food into schools to eat – but parents and legislators are working on getting fresh food into cafeterias. Farm to school movement is blowing up in NY and around country. National Farm to School Network getting farm fresh food into schools. Spring gardening – kids get a crop of strawberries before they get out, spicy and colorful foods, lots of lettuces and greens… lends itself to a salad bar, and then Elizabeth prepares the gardens during the summer so that things are established and ready to harvest when they come back like cucumbers and radishes – mostly finger foods that don’t have to be prepared in lunchroom … Do need parental and faculty involvement for success. Food you are what you eat. Food is at the forefront of our planet for our structures. In order to grow healthy food we also need clean water. More schools participating in the national farm to school network and get processed food out of schools and teaching them correct nutrition. Kids will eat healthy foods. Eat a plate of dirt. First generation of children that won’t outlive their parents. There is so much happening a great time to start a food endeavor, get food into schools, educating about proper nutrition, help school districts or get involved in local legislation that would help small farmers succeed. There’s a great public awakening going on about agricultural food and farming and promoting the positive instead of the negative is going on and anybody can be a part of it!